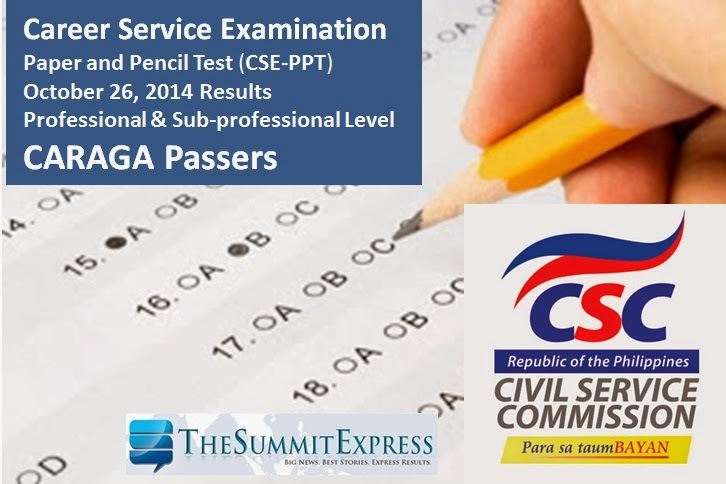 The full results of October 2014 Career Service Exam- Paper and Pencil Test (CSE-PPT) are finally out online on December 9, 2014. The Civil Service Commission(CSC) released the complete list of passers per region for the Professional and Sub-Professional Examinations. Examinees of the October 26, 2014 career service exam in Caraga may now check results on this webpage. CSC said that more than 170,000 examinees took the Civil Service Examinations in 52 test locations nationwide. 15 520092 CASINILLO, KISSEY JEN T 15 522389 CASTRO, JEALF ZENIA L.
23 15 920381 JAMERO, DANILYN C.
29 15 920353 MILLONES, CHRSLYR T.
30 15 920440 MORAN, ABEL G.
32 15 920500 OXTERO, GWENNE HANNAH H.
35 15 920507 PLAZA, AL-AMMER M.
36 15 920413 REX, CLAIENE T.
37 15 920391 REYES, MAURENE REGINE A. 38 15 920393 RUIZ, MICHAEL ANTHONY M.
40 15 920436 SANCHEZ, ANALYN J.